Is getting an orange thrown at you considered good luck? Well, yes, as a matter of fact it is, if you are in the Belgium town of Binche during their Festival, called Carnival of Binche, that takes place in the days leading up to Ash Wednesday. This nifty part of Belgium tourism actually starts weeks before with plenty of activities, but on Shrove Tuesday, the fun really gets into full swing with locals dressing up as Gilles in vibrant dress and wooden shoes parading around town warding off evil spirits with sticks. Later the oranges come out and if you happen to have one thrown at you, consider yourself lucky. This is just one of the things that makes Belgium an interesting vacation spot and offers something different for tourists of all ages to enjoy. 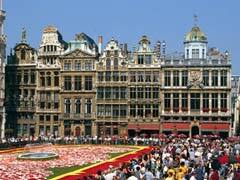 Brussels is the hub of Belgium travel, as the capital city and home of the Atomium, quite possibly the most distinct structure in all of Europe and certainly a well- known tourist attraction. This spherical masterpiece was built for the World’s Fair in 1958 and now 5 of her spheres are open to the public housing exhibitions, art shows, and a restaurant that offers stunning views of the city. Mini-Europe is part of a theme park that also houses the Atomium, an amusement park and a water park and is home to over 350 monuments and landmarks from around Europe all in miniature and to scale. Here tourists can see what makes each country special without setting foot near an airport, and all in the space of a few hours. 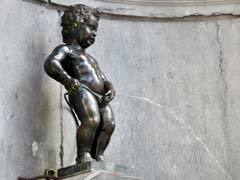 No Belgium vacation is complete until you have seen for yourself the Peeing Boy statue, located just a few streets from another of Belgium’s travel destinations, the Grand Place a 15th century town square full of charm and history. Brussels is known the world over for its chocolate and beer and both are showcased in museums where Belgium vacationers can see for themselves how beer is made, the history of beer and even enjoy said beer at the Museum of Belgium Brewers. Chocolate lovers will rejoice at the sight of the Museum of Cocoa and Chocolate where along with demonstrations, there are various tastings. For kids of all ages don’t miss the Toy Museum which is packed to the rafters with toys from all different decades, truly a place that vacationers will find interesting as they reminisce about their childhoods. If cars are your thing, then you won’t want to miss Autoworld with its collection of classic cars dating back to the 1890’s. The Belgium city of Bruges is a World Heritage City filled with architecture, museums and places of interest that travelers to Belgium can see either with a walking tour, by boat, by horse drawn carriage or by hot air balloon. Bruges’ Bruggemuseum is a tour of 12 sites including Lantern Tower, Church of our Lady, Town Hall and Ghent Gate to name just a few that each show off their history in their own unique way and if you like history and art, be sure to check out the St. John’s Hospital Museum. Here artifacts, art, paintings and sculptures mix with stories throughout the years in an 800 year old building with an apothecary display complete with medicinal herb garden and a healthcare reference library. 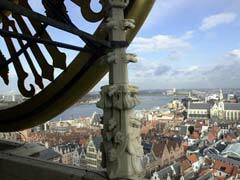 Tourists to Belgium should not bypass Antwerp, the diamond capital of the world. Lying to the north of Brussels, this city depends on diamonds for its livelihood, with craftsmen polishing, cutting and trading these precious gems. The diamond district allows vacationers the chance to see these people in action, and watch as a raw diamond gets changed into beautiful jewellery and of course, you have the opportunity to purchase one or two for yourself as well. Also in Antwerp and making for a beautiful tourist destination is Steen Castle. This 11th century building once housed a jail, but today is home to the National Maritime Museum. Tourists to Belgium can also take in the Middelheim Open Air Museum. Set in a park, this museum offers over 400 works on display from some of the biggest names in the art world and allows for a relaxing walk for vacationers while taking in the sights. Belgium tourism is full of interesting places to see and many architectural marvels that, when added to the history of the region will leave vacationers with many memories to last a lifetime. 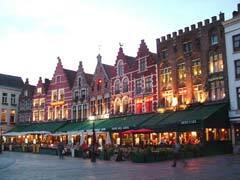 Known for its chocolate (they produce 172,000 tons of it a year) beer and diamonds, this lively country is also steeped in tradition as travelers to Belgium can easily see with the many landmarks, castles, palaces, towers and other places of interest that are vying for vacationers’ attention. From colorful festivals to friendly people, this small European country is just waiting to be discovered, again.